In this post you will learn about the first two shots of the game and how you can practice them on your own (which we highly recommend). When you come to the courts during drop in play from 8:00 to 10:00 please be aware that Courts 1, 2 and 3 are for "recreational" play and Court 4 is for more "competitive" play. We may not always be able to accommodate brand new beginners but whenever possible at least one of us will work with you. If you are able to hang around until after 10:00 then some of the more experienced players may be willing to stay and help you get started in this fun game. 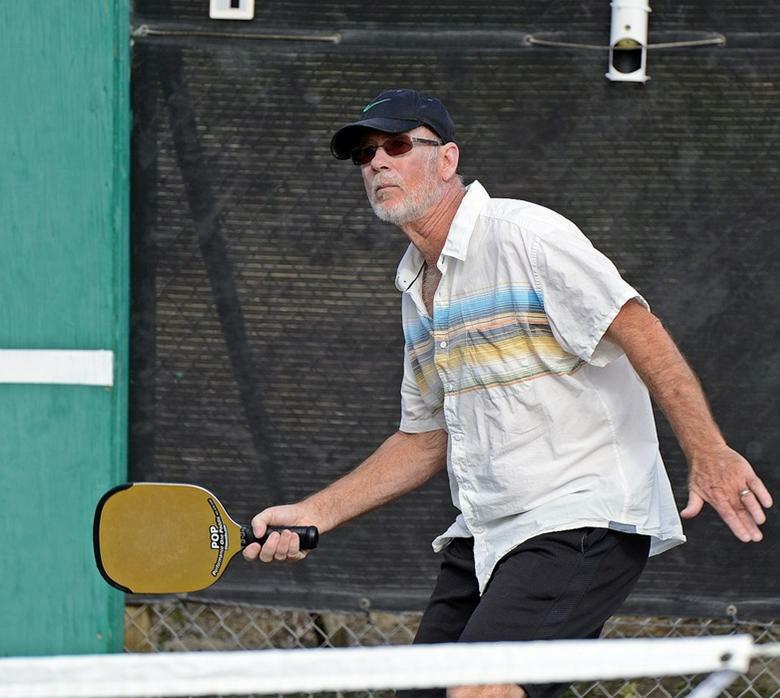 Beginning players are also encouraged to arrange for some Pickleball lessons from any of the following experienced players here at Jojoba. You may call from any park phone. The player who is serving the ball at the beginning of a game should stand on the right hand side of the court between the sideline and the center line. The server stands behind the baseline and may not step into the court until after the ball is struck. The ball is hit into the the opponent's court that is diagonally across from them but it cannot land in the Kitchen or touch the Kitchen line. It may hit the sideline or the baseline as long as it actually touches the line. If the ball tips the net before going into the diagonal court it is a "let ball" and served over. Otherwise, if it hits the net it is "out". 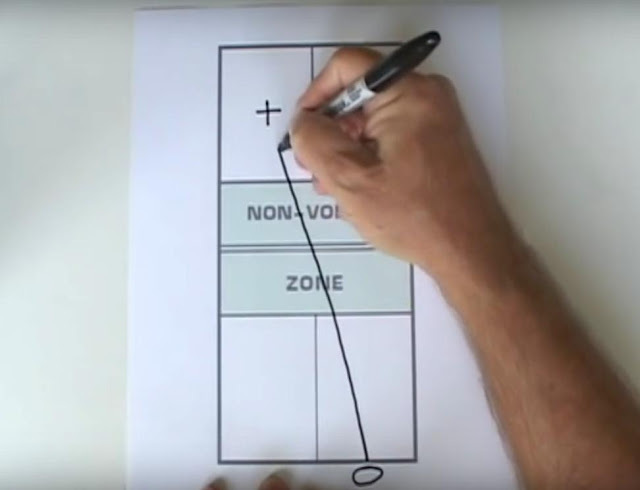 This video by Joe Baker, “Doubles Pickleball Strategy 101-How to Play Smart Pickleball, Ten Tips”, is a good introduction to playing the game. His teaching method is slow paced and his graphics are low budget but his information is excellent. The entire video is nearly 30 minutes long but for this post covering the first two shots of the game only the first four minutes are applicable. Something you may notice in his clips of tournament play is the players serving the ball appear to be serving from their partner's side of the court at times and then moving over to their own. It is a tactic called "stacking". But you can ignore it as we don't do it at Jojoba even in our tournaments. ... and then follow through with your paddle. 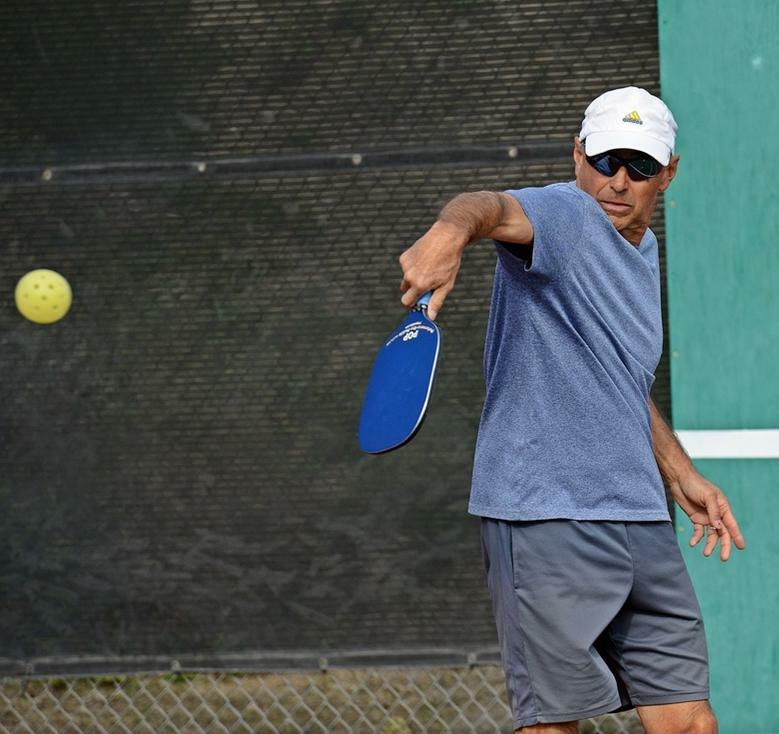 Prem Carnot (the "Pickleball Guru"), in his book Smart Pickleball, states that when serving one should aim so that the ball is about 10 to 12 feet in the air when it crosses their opponent's Kitchen line as that will ensure that the ball will land deep, about 2 to 3 feet from the baseline. Some more competitive players do really low, hard and fast serves. It looks impressive but for beginning players a higher slower serve is perfectly fine. As a recreational player your objective is to simply get the ball in play. And don't forget to say the score before each serve; your team's score, your opponent's score and which server you are, first or second. If you need to you can review the "Order of Serving". One other thing. Anytime you hit a ball and it goes out of bounds into a neighboring court where people are playing call out "ball in court" or simply "ball". This is a safety measure to prevent anyone from tripping on an errant ball. You should say the same thing if a ball from another court enters the one you are playing on. Play is stopped and the ball is served over again. It is embarrassing to be the cause of stopping the play in another court but everyone does it at some point. All you can do is say you are sorry and vow to yourself you will improve your game. Other players may voice disappointment that their game was interrupted especially if they were in the middle of a good rally but I have never heard anyone express anger here at Jojoba. You will have plenty of opportunities for your own game to be interrupted by a ball from an adjacent court and you will be expected to also be a good sport about it. Serving the ball is something you can practice on your own and it is highly recommended that you do so. The way to do it is to go to the court and use one of the metal baskets to hold at least a dozen balls (you can remove them from the ball holders attached to the fence near every court). The metal basket handles fold down to form legs. The best court to use is Court 4, the court farthest from Friendship Hall, and can be done whenever this court is not in use by Pickleball or Tennis players. We share the courts with tennis players and they are scheduled from 12:00 to 2:00 each day. However, there are few tennis players here so the courts will most likely be available at that time. Start on the end closest to the gate and serve from the baseline in the left hand box. This way the balls will all tend to go into the far right corner and make it easier to pick them up. Serve all of the balls. Then go to the opposite side of the court and gather them up. Then serve from the baseline of the right hand box so the balls go into the far left corner. I know from personal experience that by doing this you will develop the "muscle memory" needed to be able to serve in bounds consistently. If you are the player receiving the serve then you should stand well back, even behind the baseline, as the server will most likely be hitting the ball deep into your court. An important rule to remember is that the player receiving the serve must allow the ball to bounce once before hitting it. 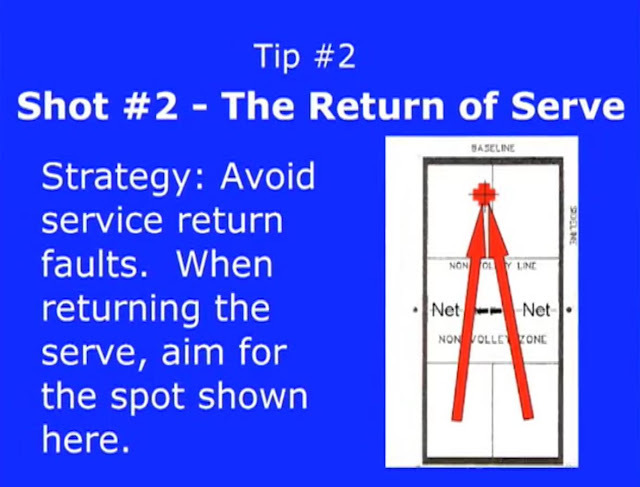 This video by Picklepong Deb helps to illustrate the return of serve. If you haven't already watched this part of Joe Baker's video, “Doubles Pickleball Strategy 101-How to Play Smart Pickleball, Ten Tips”, where he covers the return of serve then you should do so now. It starts about two and a half minutes in. There are four basic ways to hit the ball which are pretty self explanatory; forehand, backhand, underhand and over head. While the serve must be hit underhand any of these may be used on subsequent shots. If you return the ball with a forehand then step forward with your left foot (presuming you are right handed) turning slightly sideways before hitting the ball. If you return the serve with a backhand then step forward with your right foot (again presuming you are right handed) and again turning slightly sideways before hitting the ball. The idea is to "stroke" the ball rather than slapping at it with your paddle. It is the ultimate goal of all players to position themselves at the Kitchen line because this puts them not only in the strongest offensive position but the strongest defensive position as well. 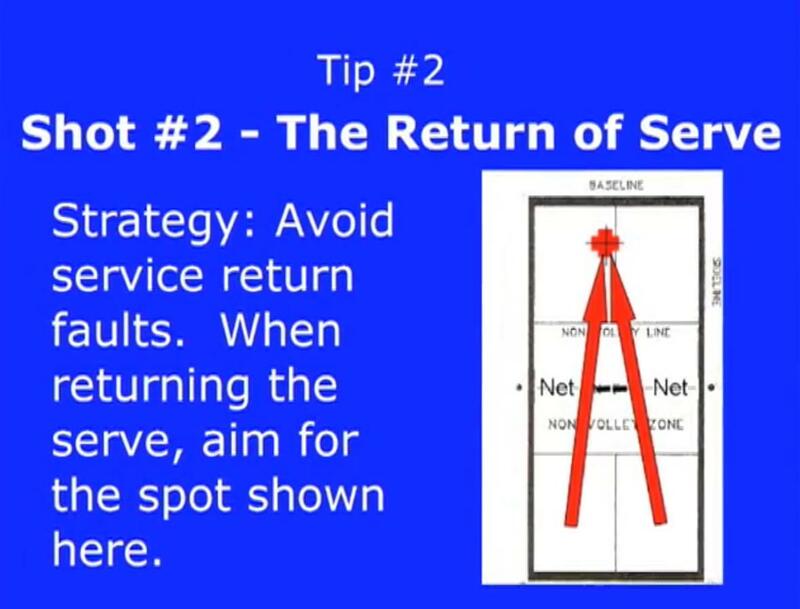 The person receiving the serve can start to move up once they have returned the serve. It is a good idea for this return of serve to be hit deep into their opponent's court. This will give the person returning the serve more time to get to the Kitchen line before their opponent can hit it back. Like it said in the post, "Getting Ready to Play" and "where to stand" the teammate of the person who is receiving the serve starts the game standing up at the Kitchen line. It is a good idea for this player, who is opposite the server, to step closer to the sideline and keep their eyes on the ball. One reason is so they can better dodge the ball if the serve is hit down the middle to their partner's backhand or it is hit wide. 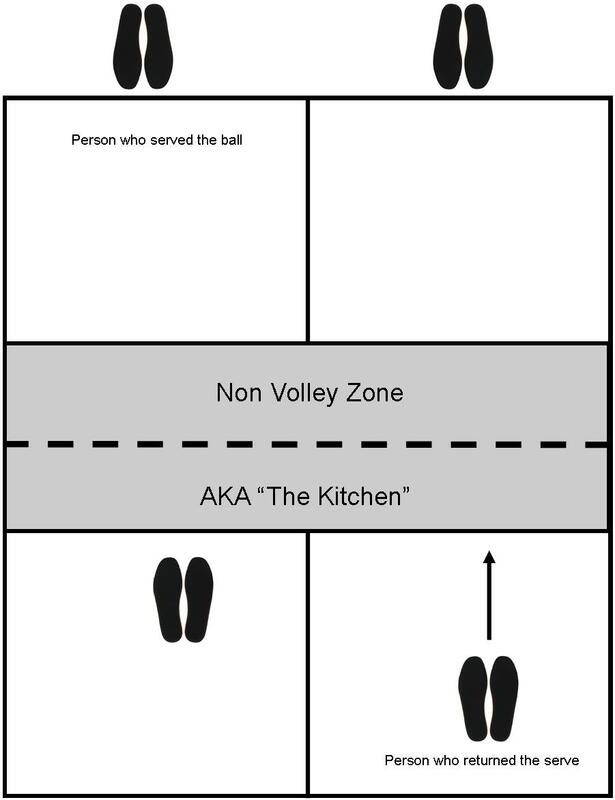 It is important to know that if the ball touches that person or their paddle then the serving team gets the point. This person should also turn just enough so they can watch the ball until it bounces so they can help their partner to judge whether a ball that hits the line is “in” or “out”. Once their partner has returned the serve they should get back into position in the middle of their side of the court and into the ready position. ... and join their teammate at the Kitchen line. A good way to practice returning the serve is to line up a practice buddy. Then the two of you can practice these first two shots together, one serves and the other returns it. You can take turns being the one who serves. Avoid the temptation to try to keep hitting the ball back and forth to see how long you can "keep it going" as this won't improve your skills with these first two shots. You can also practice this shot if you are by yourself. Simply stand at the baseline, bounce the ball and then hit it. You can use one the of the wire baskets and load it up with balls like you may have done when practicing your serve. Remember the goal is to hit it deep into your opponent's court. 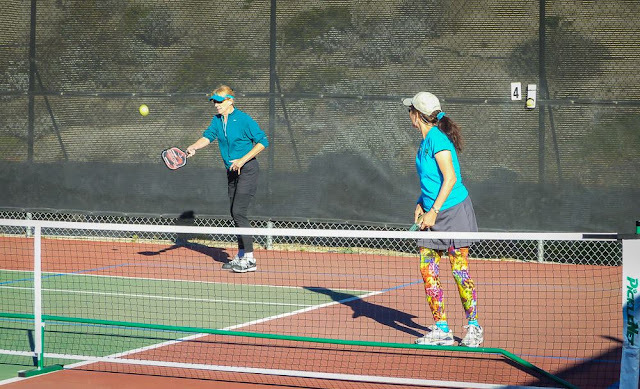 Perhaps the most effective way to practice returning the serve is to use our "Pickleball Tutor" ball machine. This machine enables players to practice a variety of shots including the return of serve. If you are a visitor to the park we ask that you please have one of our experienced Pickleball players to be with you when you use it. If you are a brand new player we suggest you have an experienced player work with you. If there is no one at the courts you can call John Strother at 4511 from any park phone and we will do our best to accommodate you. 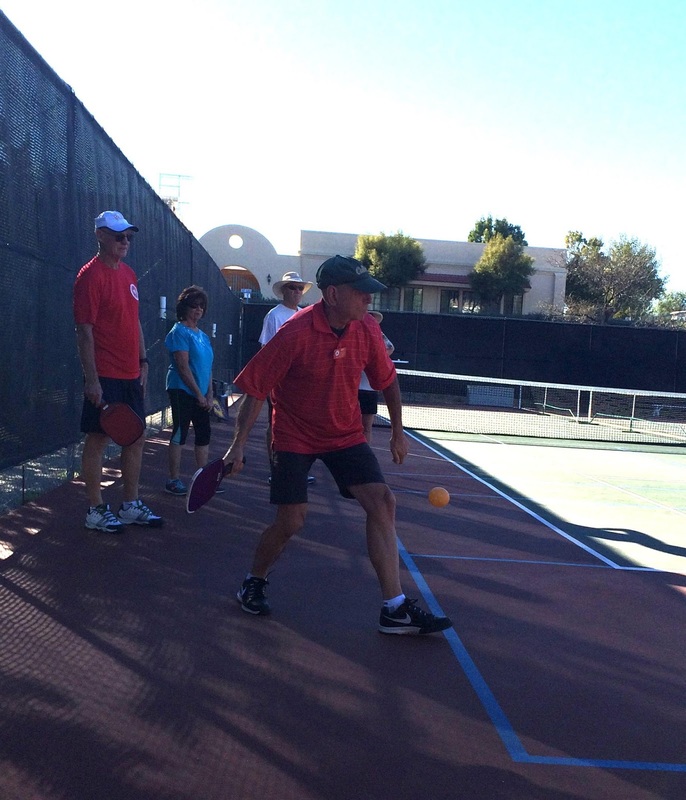 If you are one of our members and you have played some Pickleball at Jojoba then you are encouraged to give it a try. 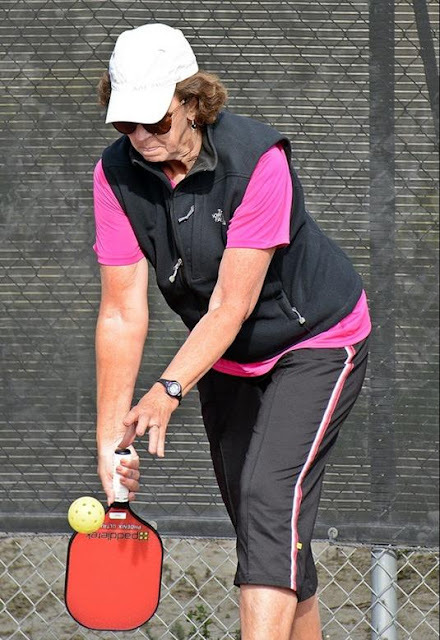 Before you use it please read the Owner's Manual as well as the information on our Pickleball Tutor page. This is a serious and expensive piece of equipment and we don't want it damaged. Most importantly we don't want YOU to get damaged!!! I've heard the first two shots of the game referred to as the "formalities". They don't have to be "killer" shots, they just have to be good enough to get the ball in play. 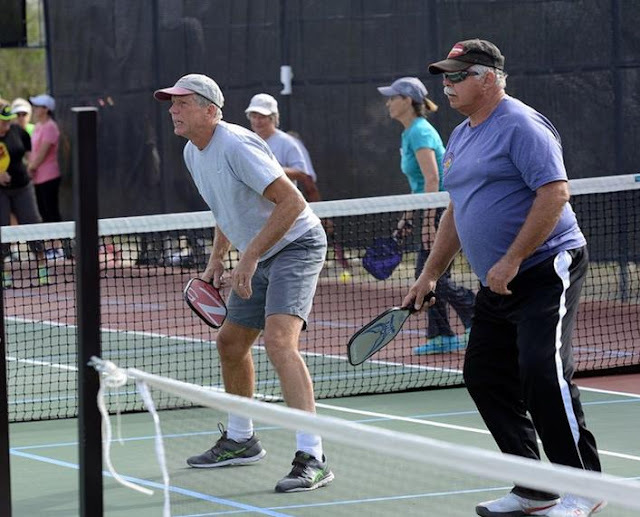 At the outset Pickleball may seem like a pretty simple game but after playing it for a while you will begin to learn that Pickleball is actually a very strategic. game. The goal of skilled players is to make shots that move their opponents out of position hoping their opponent will then make an “unforced error” (they hit the ball into the net or out of bounds). Or that their opponent returns the ball in such a way as to provide them with an opportunity to “put it away”. I know from personal experience that it is overwhelming for a beginner to hear about all the different shots one could make and the different circumstances that call for different strategies. 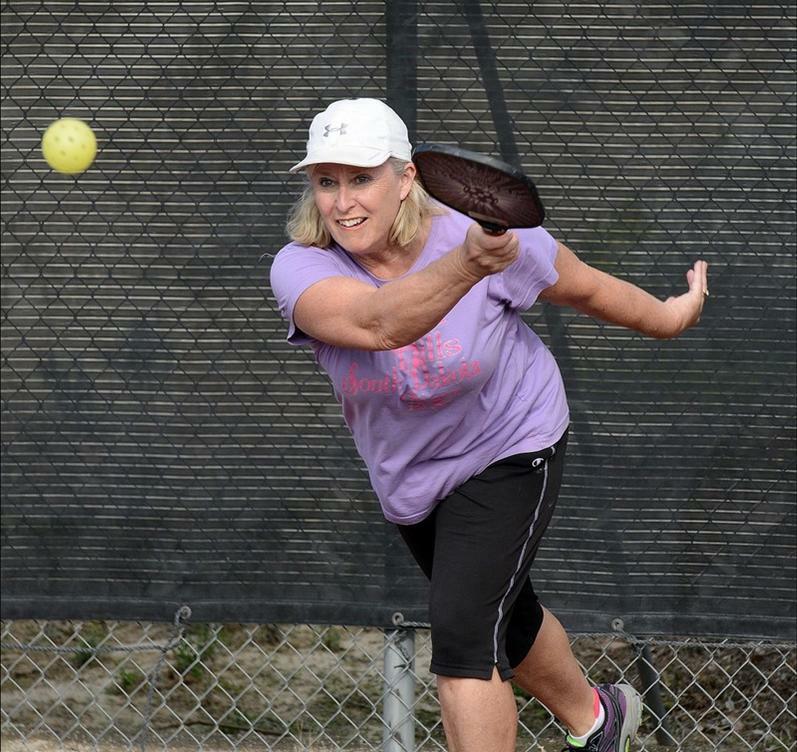 Beginners with a tennis background handle this better than those of us who don’t. Oftentimes all the strategy a new beginning player can handle is to get the ball over the net and keep it in bounds. But hang in there! Now, if you are are ready to learn what to do after the second shot follow this link to “Continuing to Play”.